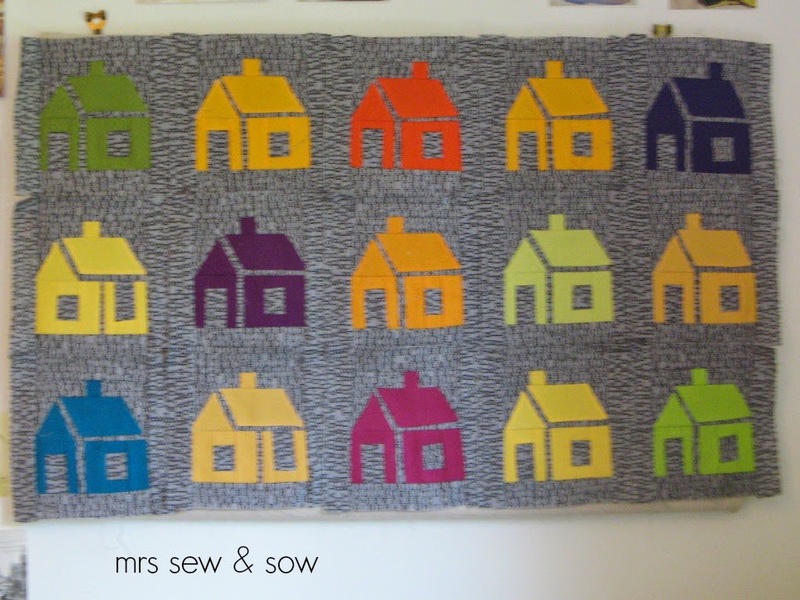 I am pleased to say that I have finished another quilt. This one started out with a book and a bee. 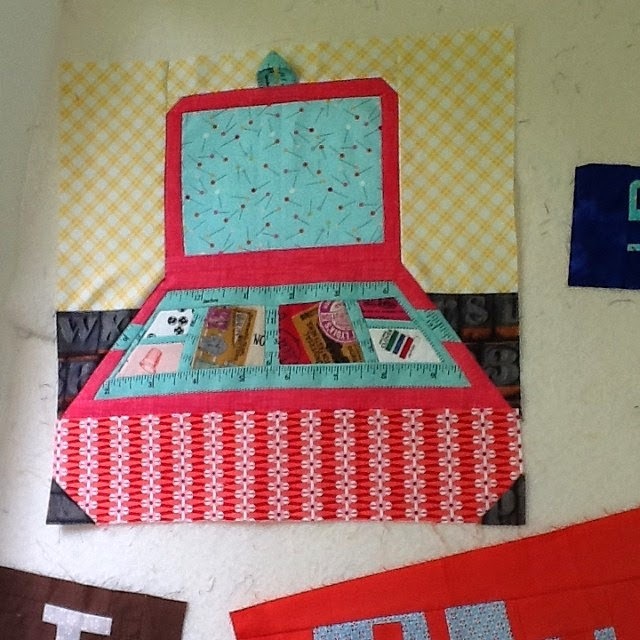 I was in the Modern Stitching Bee for a year with some lovely people. 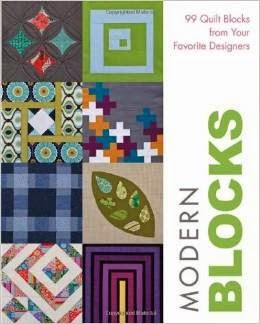 The bee was to make modern blocks using the book Modern Blocks 99 Quilt Blocks from your Favourite Designers compiled by Susanne Woods. 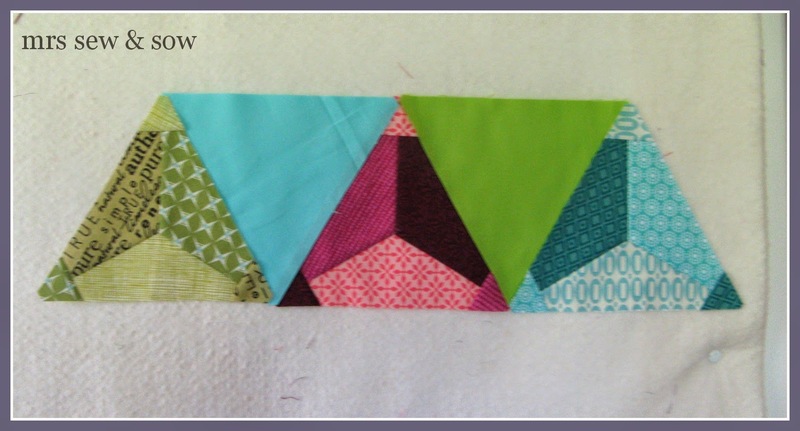 I picked the Arrowhead block designed by Wendy Hill and played with it. 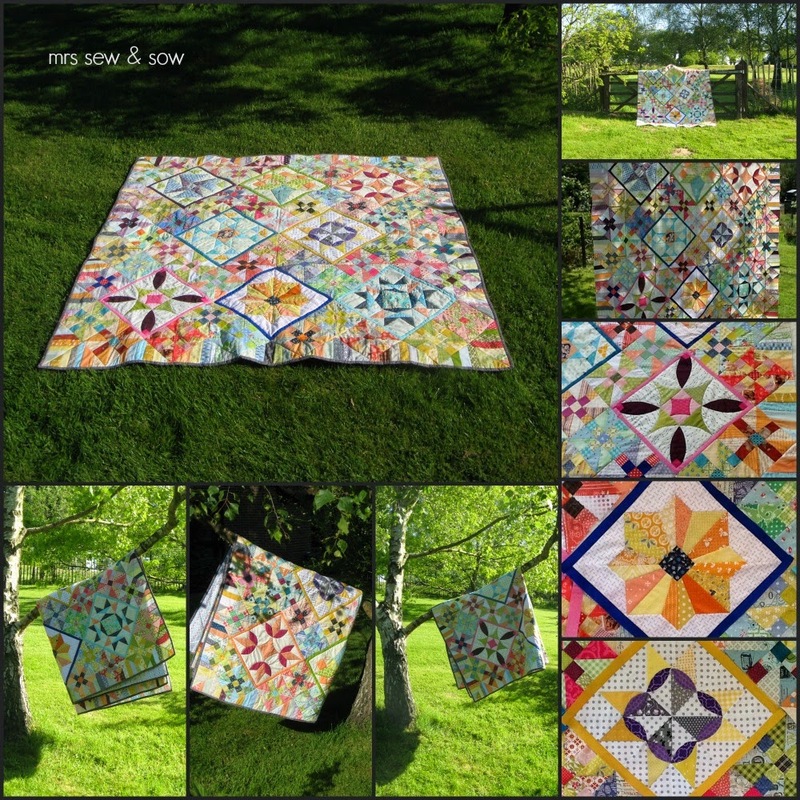 Until I designed my Arrowhead Star block and asked my bee mates for half blocks as they are rather large! 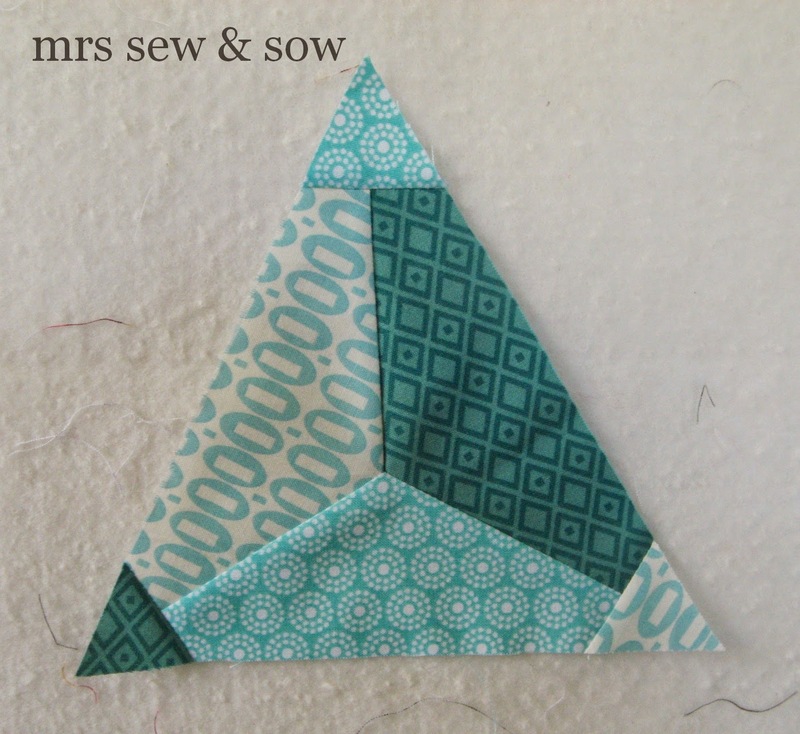 It was fun at FQ Retreat 2013 as throughout I was given little fabric parcels with my half blocks in them. I decided to try something different when quilting this one. I wanted to attempt Trapunto. I added extra wadding behind each of the stars, stitching it in the ditch and trimming the wadding back to the seamline. 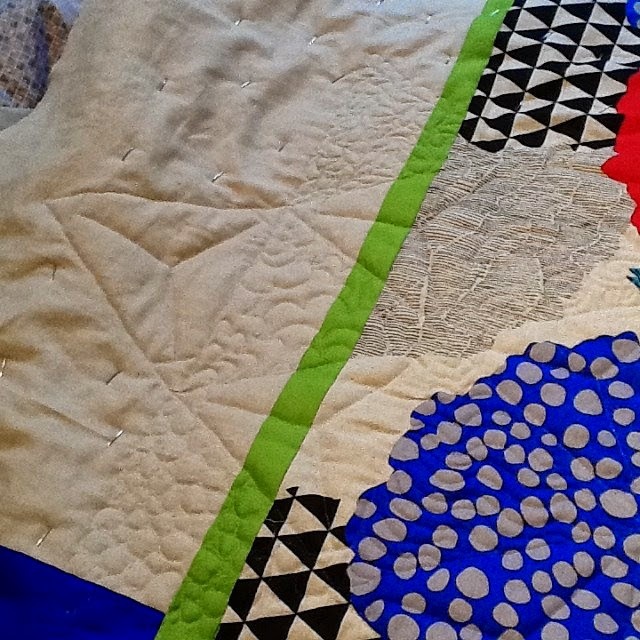 Then I layered and basted the quilt as normal. 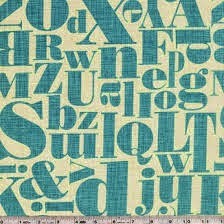 Trapunto works best when the extra padded area is lightly quilted and the background densely quilted. I tried to make the difference between my stars and the background where I attempted cosmic quilting - all solar flares, black holes and galaxies! I used a gorgeous Echino cottton/linen print on the back of this quilt and it didn't creep around like my velveteen backing - it stayed put though I did baste it with a whole lot of pins just in case. The print came from Pink Castle Fabrics and as it wasn't quite wide enough I got some help from Fiona at Celtic Fusion Fabrics to find a natural linen that would work with it (perfect match I have to say) and added some coordinating solids! I like the back almost as much as the front. I used monofilament or invisible thread in the bobbin so I just have a texture on the back. use higher loft wadding behind the area to be padded - maybe even that cheap thick poly wadding we are all a bit sniffy about or wool! densely quilt the background areas - more even than I quilted here! 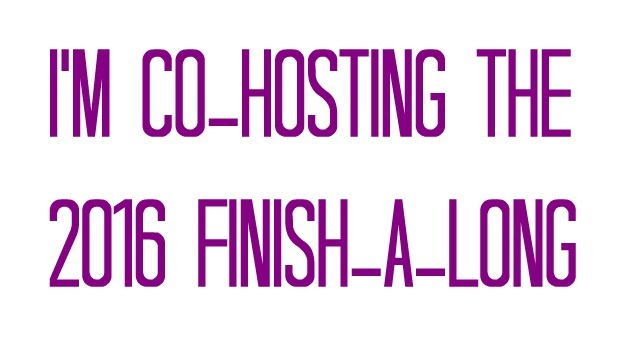 consider basting the extra wadding with dissolvable thread! 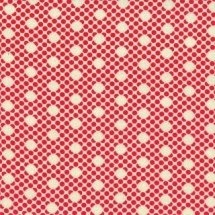 The great thing about trapunto is if there is excess top fabric - I mean it doesn't quite lie flat - that excess can be hidden in the puff! 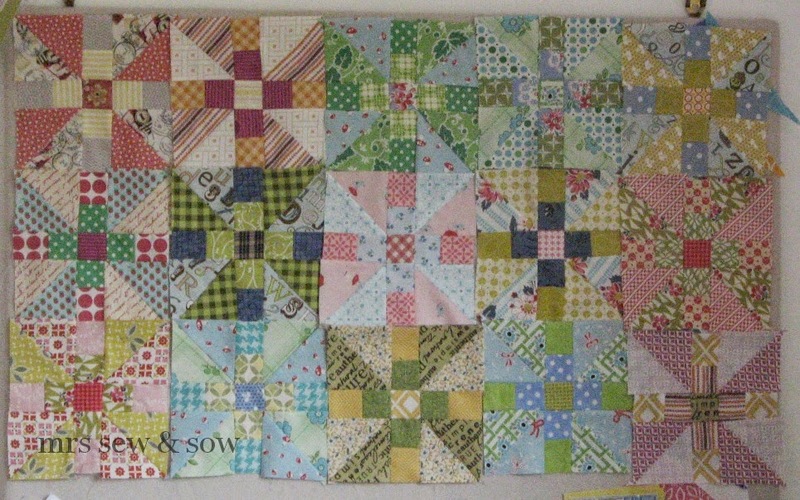 With lots of bias edges in this quilt it was easier to puff it up rather then nail it or rather quilt it flat. Hope you give trapunto a try! 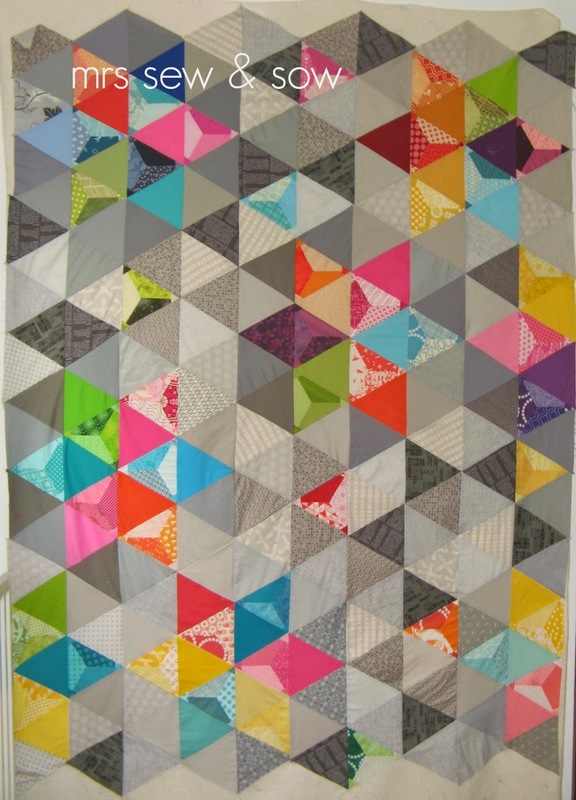 Welcome everyone to my second entry to the Blogger's Quilt Festival this time entering the ROYGBIV or Rainbow category! I'm Nicky and a Scot living with my family, cat and dog in the south of England. 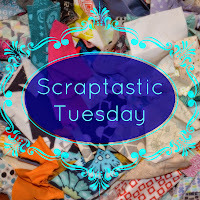 I have been sewing most of my life but only got into patchwork in the 90s and then only as a sometime hobby. 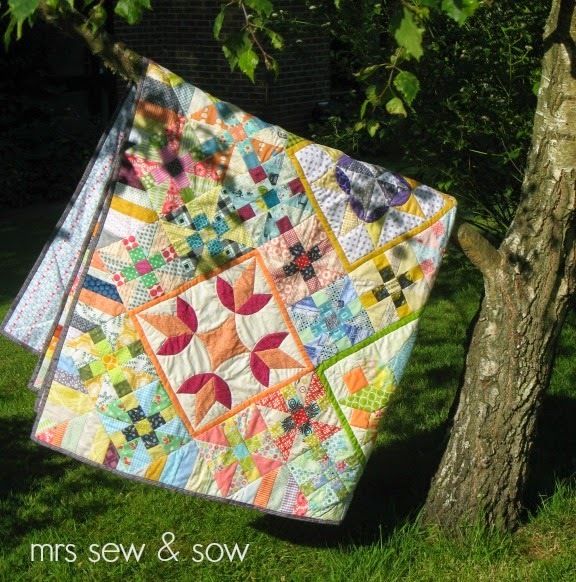 My passion for patchwork coincided with my entry into the online community in the last few years - I'm sure it was the same for lots of you! 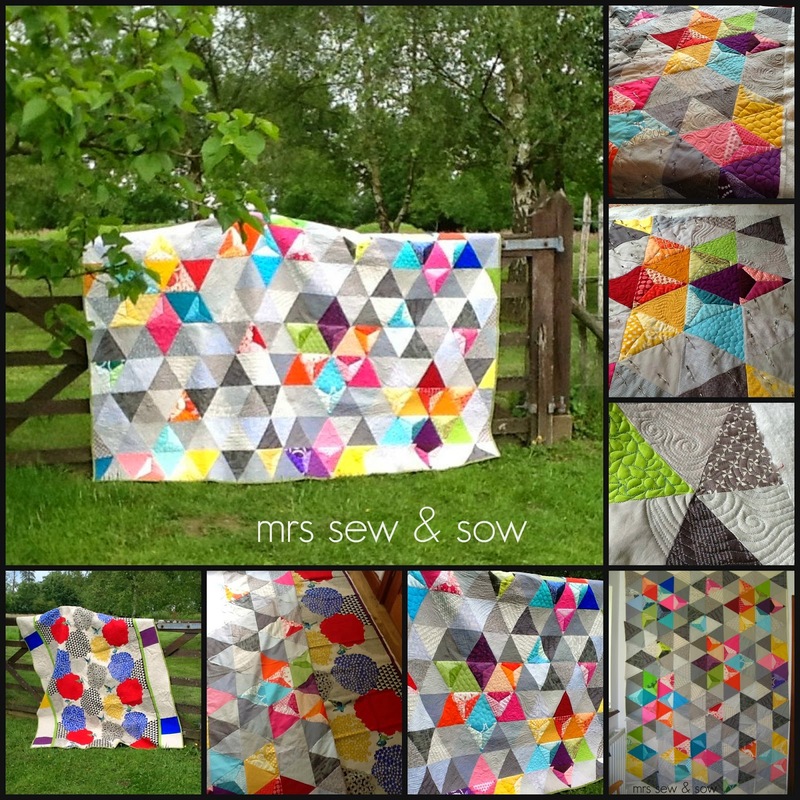 Last year I started collecting lots of solids ably assisted by Justine and her solid fabric club! I started this project as a way of keeping track of all those gorgeous colours and my idea was to create a bigger than usual colour chart! I picked the school house block (using Marti Michell's templates) as my starting point and I decided to have some fun with appropriate school subject themed background. I shelved my project after making just a few blocks on a dark text background...it was looking a little gloomy! This year I picked it for a monthly challenge in the Lazy Bum flickr group - a support group for anyone who is a stranger to quilt finishing! We had a global virtual retreat trying to complete lots of blocks! I decided my dark background worked well as a border and went for a brighter feel with cream/white backgrounds in the centre - all with a school subject theme - here is the House of Chemistry! 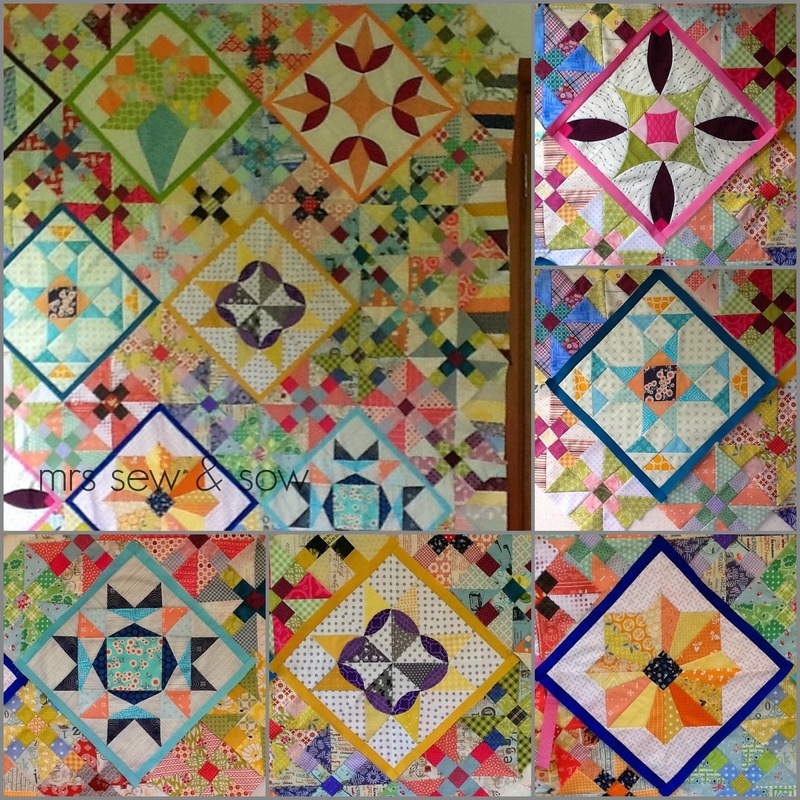 I really got going during the retreat and in one day made more blocks than I had previously by chain cutting and piecing! I became a school house block machine and ended up with 81 blocks for a 9 x 9 layout! 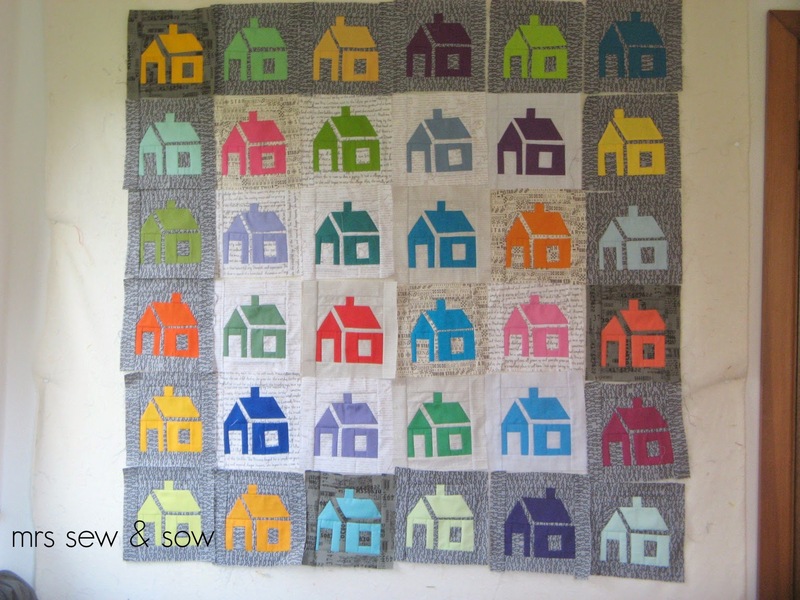 and machine quilted a grid round my blocks and hand stitched round each of my 81 houses in cotton perle...each house with a matching or toning thread! 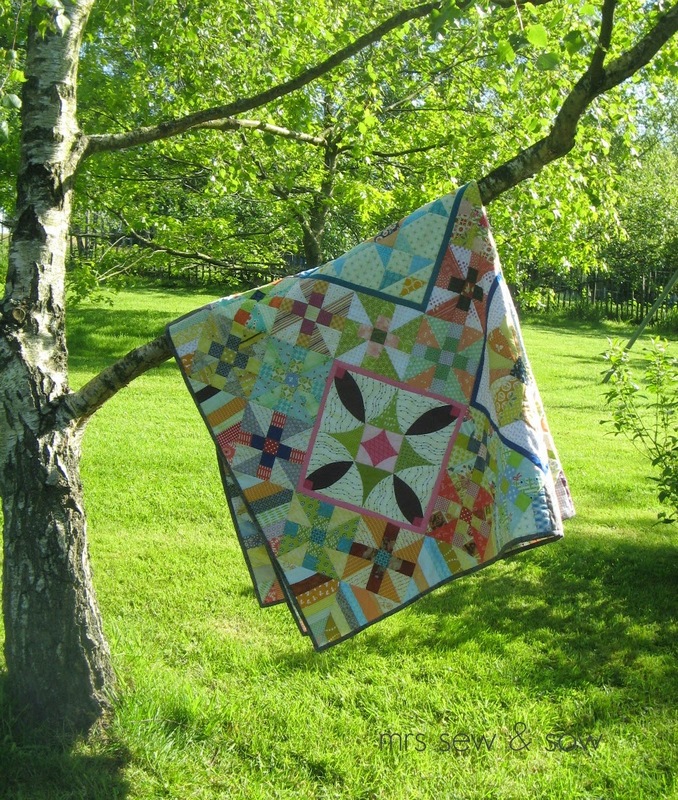 And I have to say I'm really pleased with the result - my Konaville quilt! 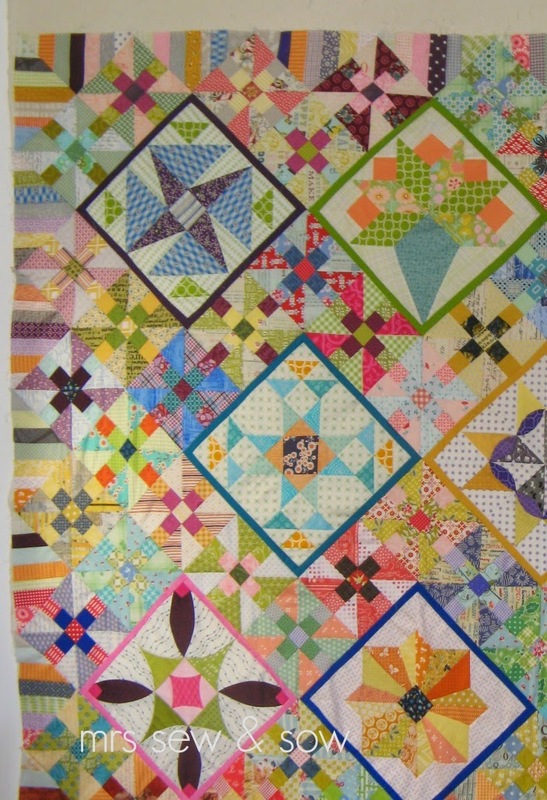 I hope you enjoy looking at the feast of quilts in this festival. 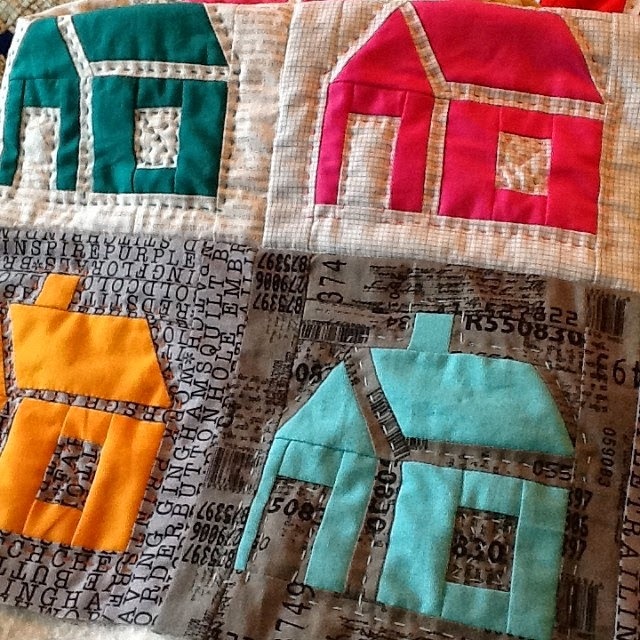 There are wonderful quilts in each and every category! Don't forget to vote and if you vote for mine then I'd like to take this opportunity to thank you - I do appreciate the compliment! 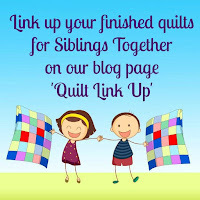 Welcome new friends and old to my blog and entry to the Blogger's Quilt Festival. 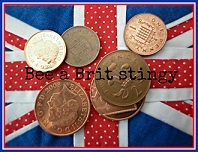 My name is Nicky and I am a Scot living in the South of England between London and the South Coast! I have been patchworking on and off since the 1990s but stitching since my teens. 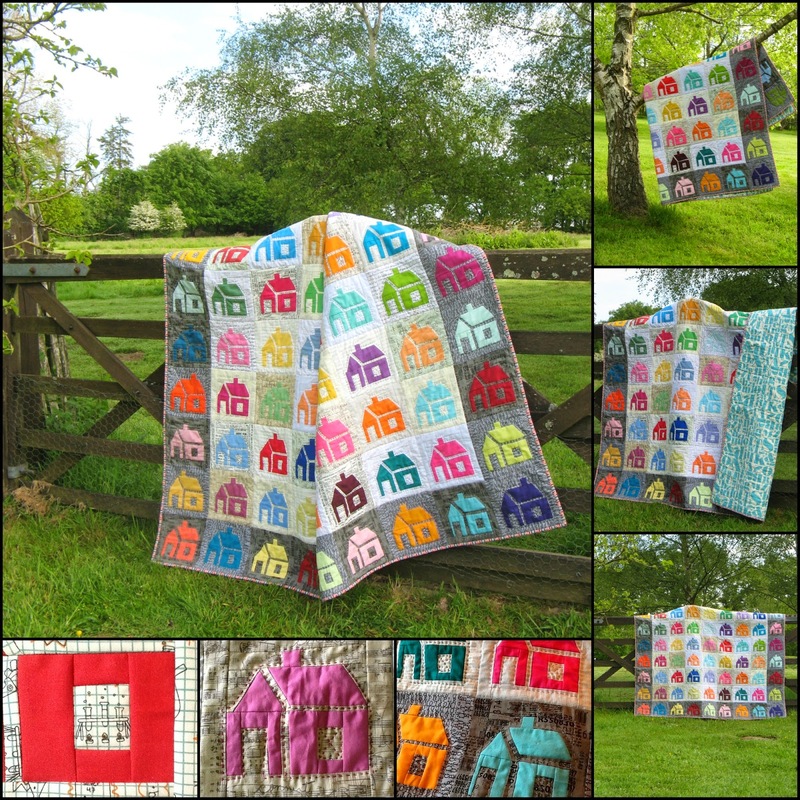 Last year I started a mountain of new projects which I had to add to my previous pile of UFOs so this year has been all about catching up and I've finished 9 quilts so far. 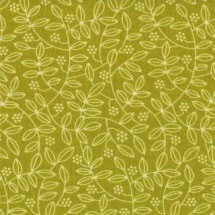 Including this one which is my own design and therefore I am entering it into the original design category. picking out the colours in the cross to match those in the HSTs. But after a while I shelved the project. This year I took it out again and decided to go a different way. 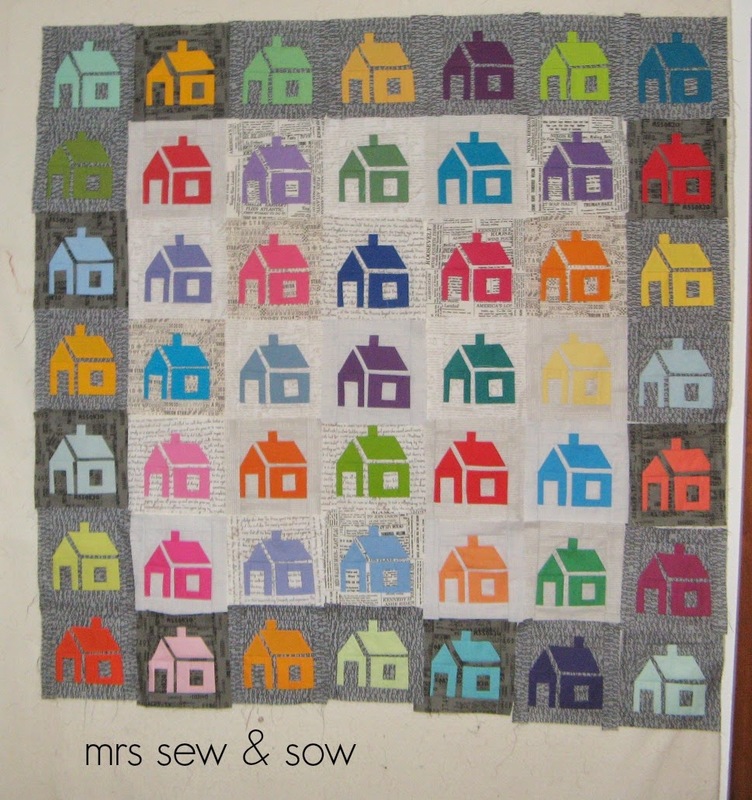 I added some vintage blocks from some out of print patchwork books. And put my blocks on point. To make my vintage blocks fit with the propeller blocks I added a narrow border again picking out one of the colours in the block. 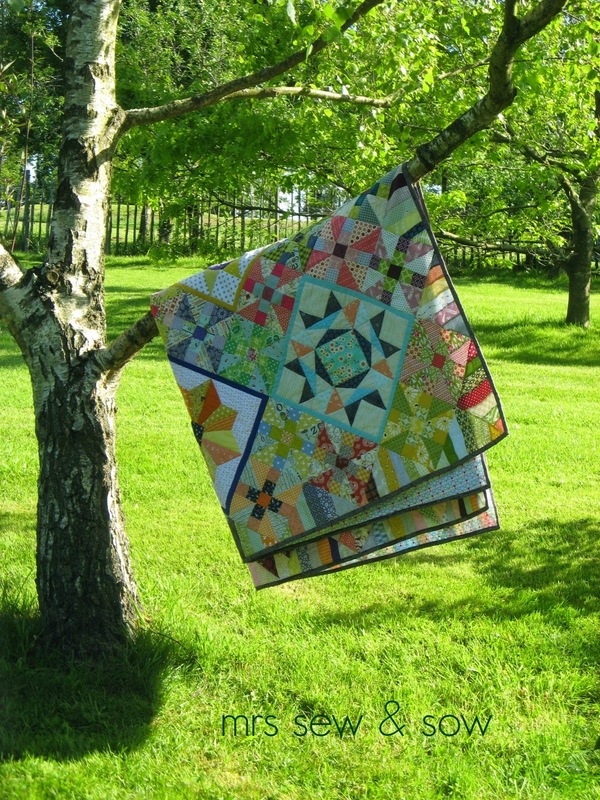 I finished the quilt with some strip pieced setting triangles and quilted it in the ditch. 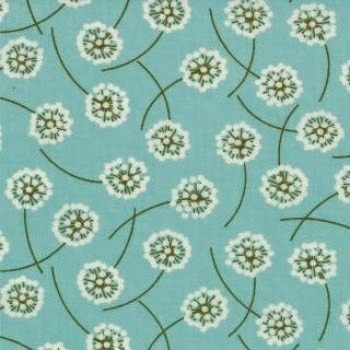 My backing - Vintage Happy Circles was bought with a giveaway voucher I won from my friend Cindy's Fluffy Sheep Quilting shop. Thanks for looking! Enjoy looking through the other entries and don't forget to vote on the 24- 30 of May for whichever beauty takes your fancy and thank you if you vote for mine! 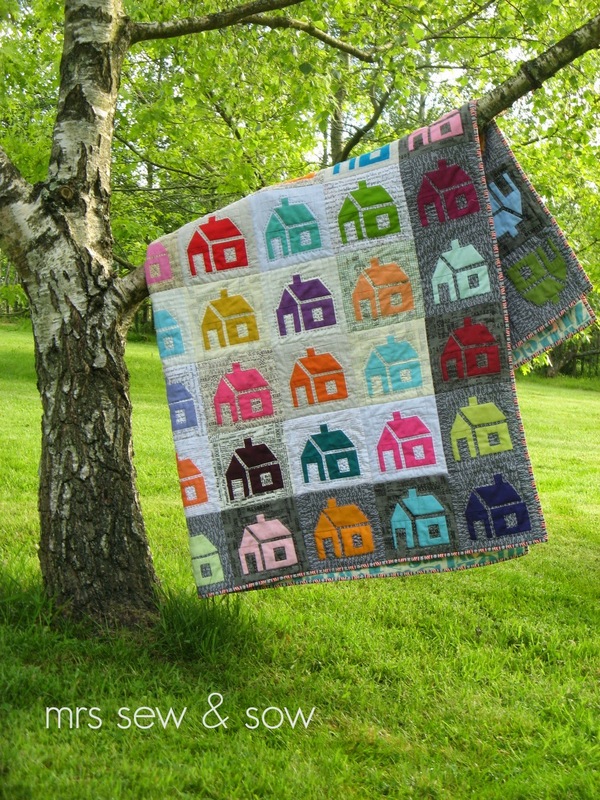 Could be my favourite quilt ever!? Current favourite (not that I have favourites - though this might be the exception) is finished. 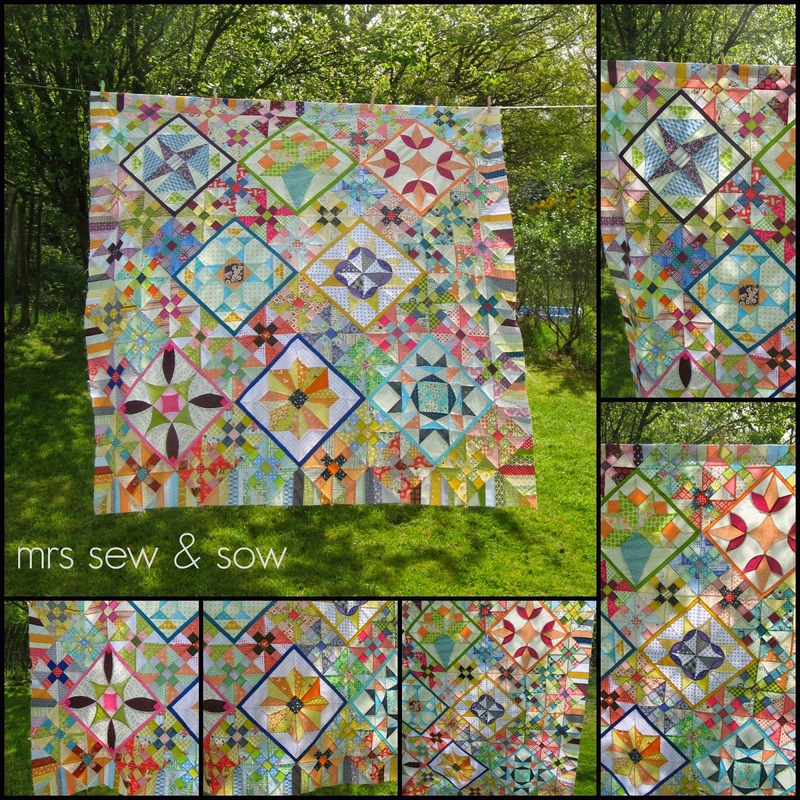 At the moment I'm just calling it Vintage Squares but I think it could do with a better name just not sure what. 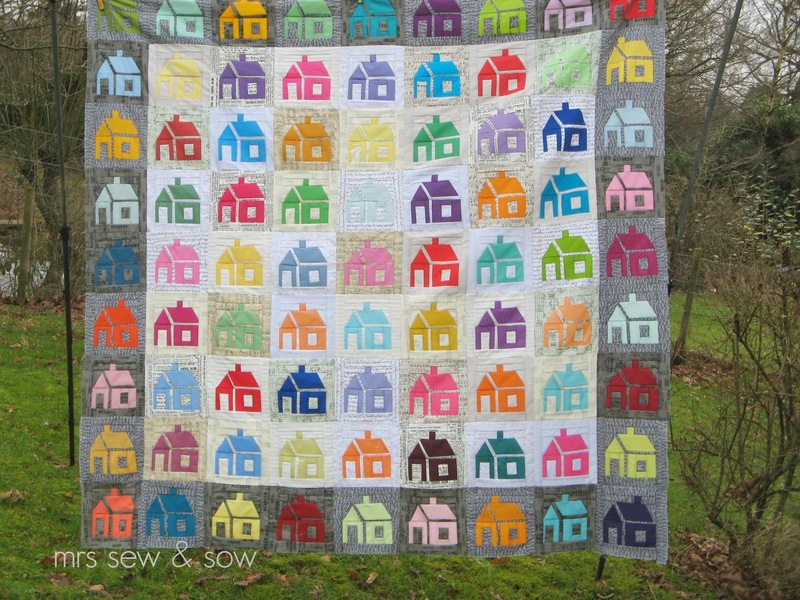 I do love this quilt though! 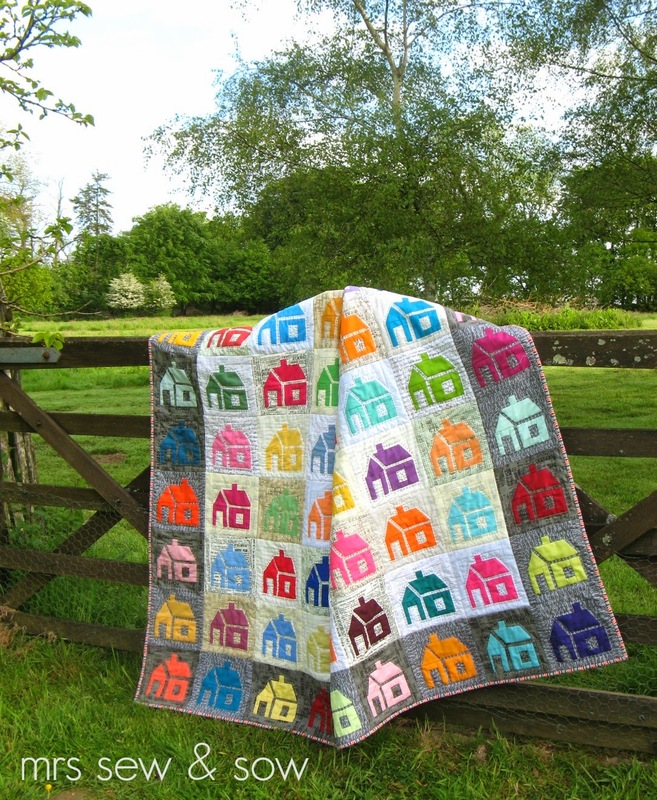 Not sure if you realised how much I love this quilt? Konaville is now complete! Happy am I! Washing line broke this morning hence the alternative rustic photo shoot! This is pretty much the view outside my sewing room window - not too shabby!? When I took up quilting Konaville by hand (my school house quilt) I was worried I'd end up with a hole in the tip of my finger - like you do when you can't get on with a thimble! 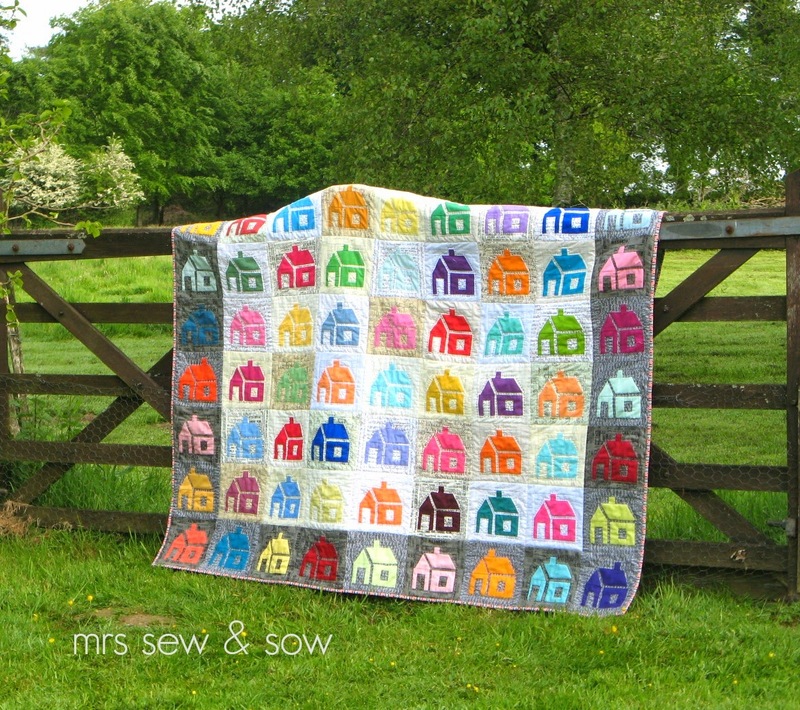 The vintage square quilt is my current favourite but shhhhh! 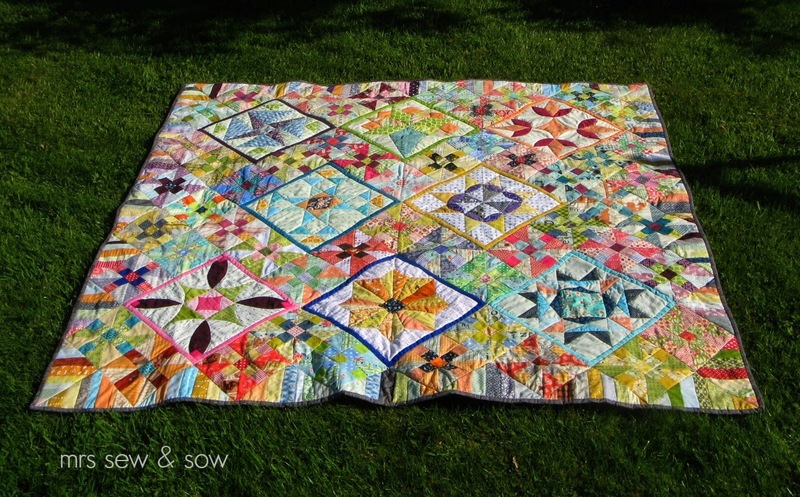 please don't tell my other quilts as I don't want to put their noses out of joint! 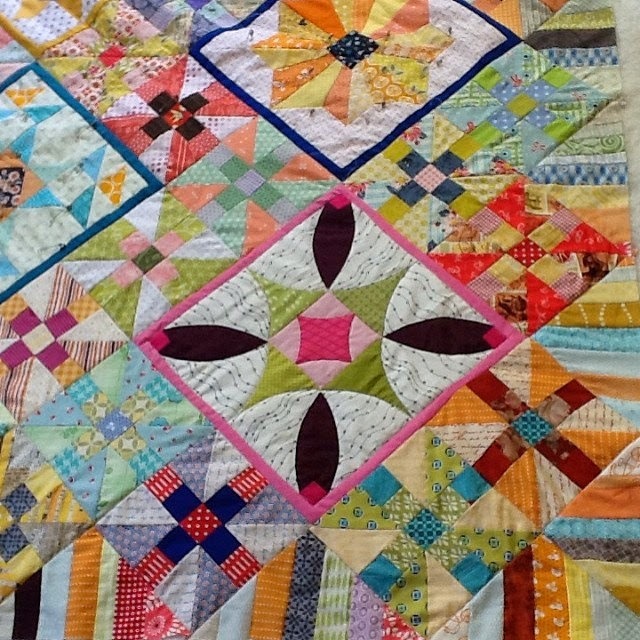 The quilt back was quickly put together and basted. 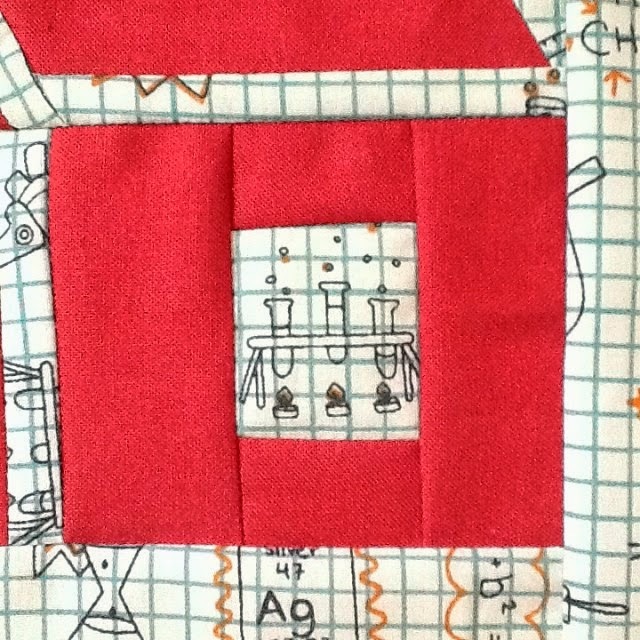 And I have started quilting it! Just in the ditch at the moment. 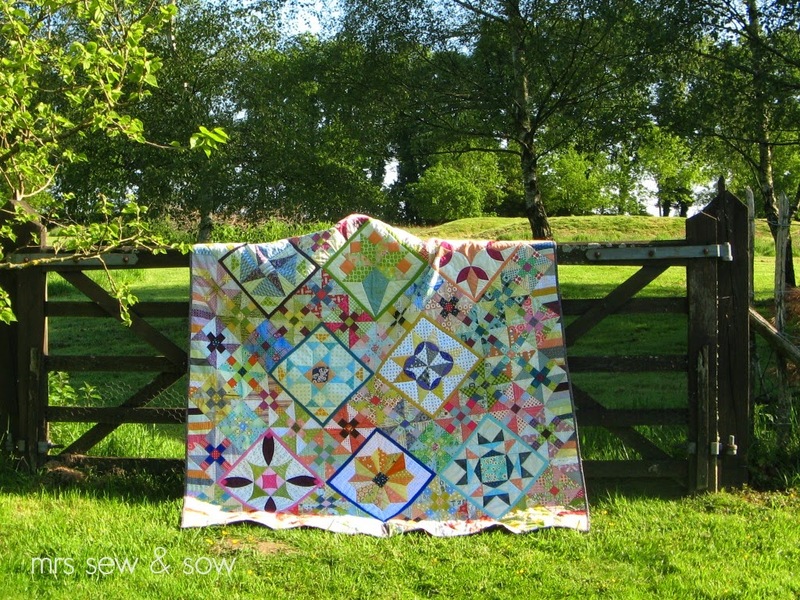 Not sure if it needs anything else though....as it is such a busy quilt! 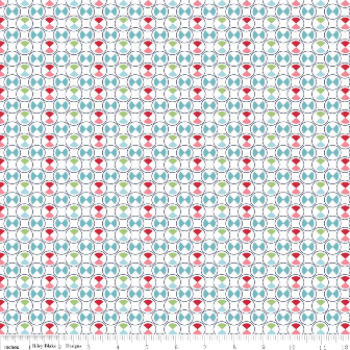 I do think persian rugs may have been an influence in this design...? 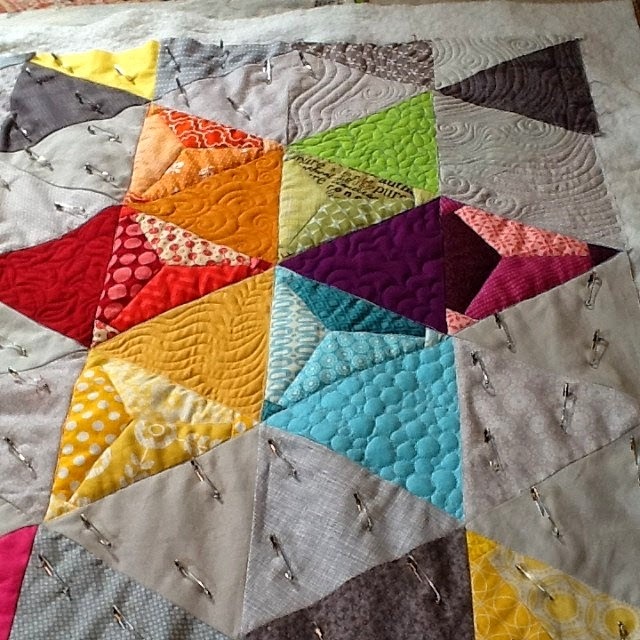 Made from a pattern by Kerry for the Sewing Out Loud QAL! 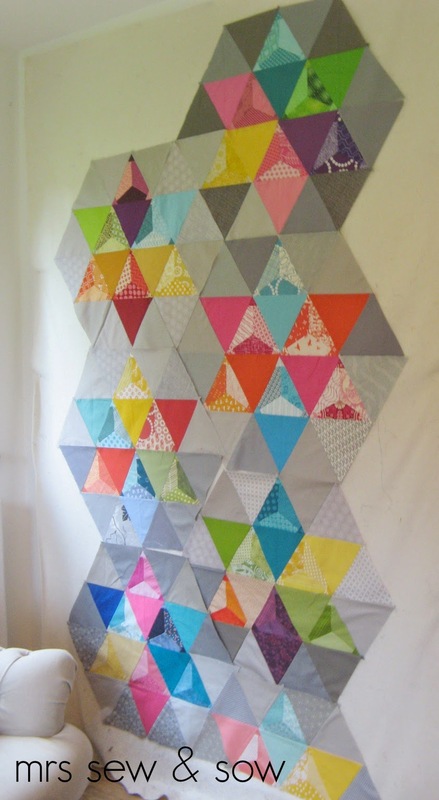 Just can't seem to stop paper piecing at the moment...! The Fluffy Sheep Turns Two! My lovely friend Cindy is celebrating two years of fluffy sheep shopping with a sale! Starting today there will be a 15% discount using the code bday15%, lasting for one week from 14th through till 21st of May. <Rocket Age> for the little or big boy in your life!? 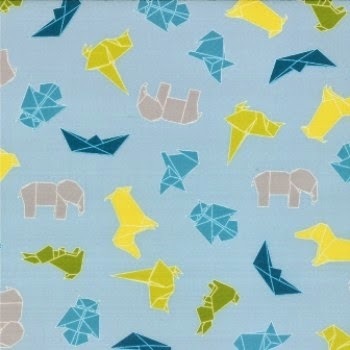 <Mixed Bag Origami Sky> but lots of others too! All super bright and adorable! 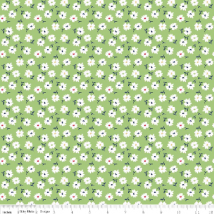 Sevenberry <strawberries in white> - only 2FQs left ! <Leaf> love a tonal me! 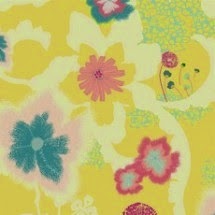 <Rapture Dreamscape Sun> - have my eye on this as backing fabric! All the above, lots more prints and solids galore! 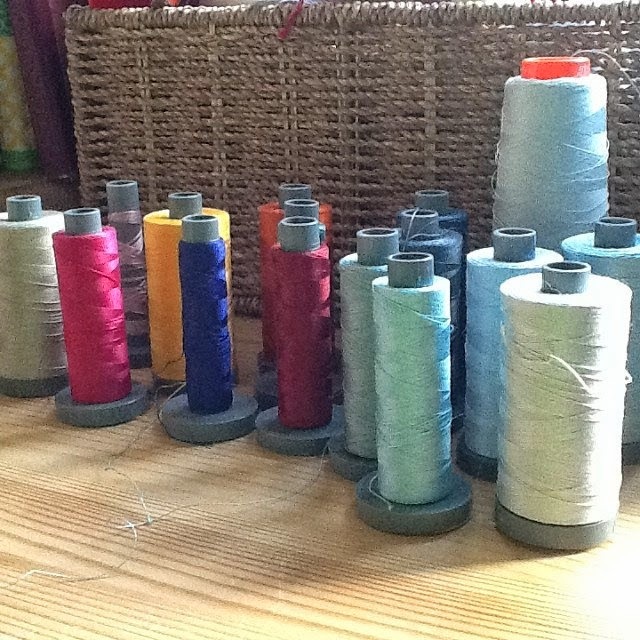 Plus glorious thread from Aurifil too! 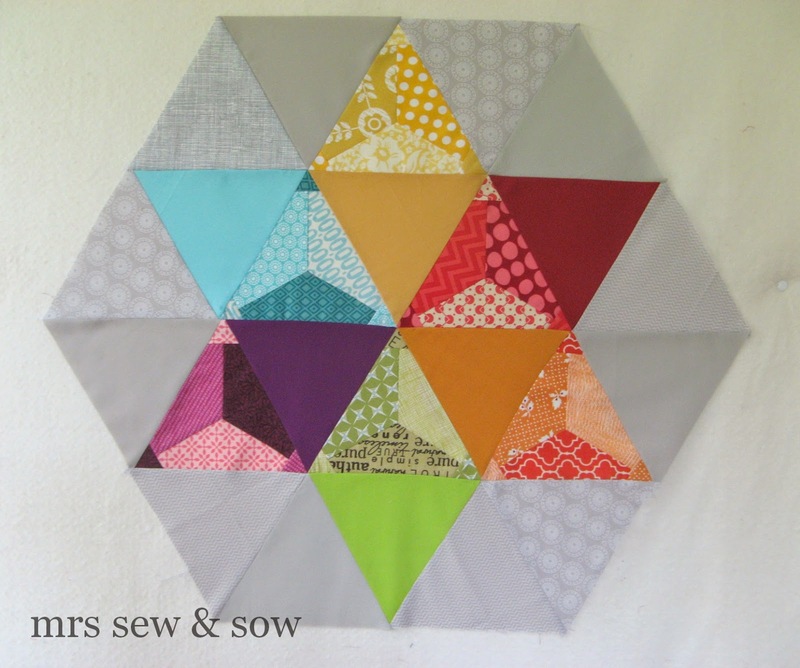 Got the paper piecing bug!